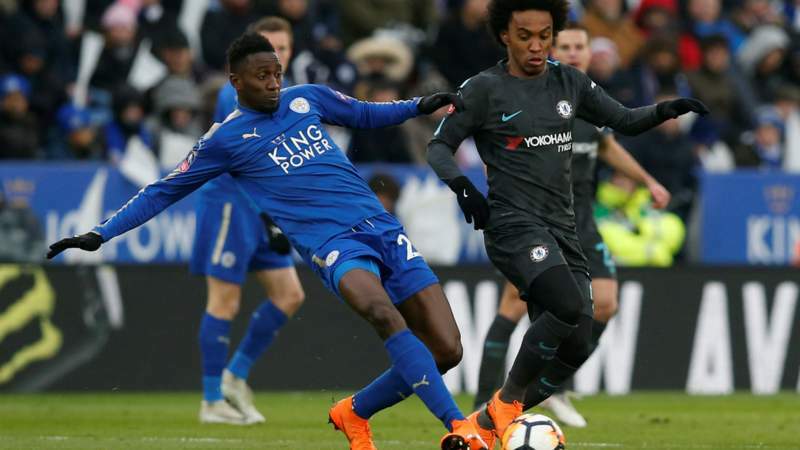 Chelsea battled to a hard fought victory in their FA Cup quarter final against Leicester at the King Power stadium, eventually overcoming the Foxes in extra time. Leicester were well up for this one from the get go, and the opening twenty minutes saw high tempo football from both sides, with midfielders in both camps guilty of giving the ball away. Chelsea had perhaps the better of the play as the half went on, and had the first big chance as Morata had the space to take aim but found on the gloves of Schmeichel. The Spanish striker then made another chance for himself, but shot from an impossible angle rather than squaring the ball. He made up for it moments later through with a cool finish after a rapid break which saw Willian pick up the ball on the edge of his area, dart forward past the Leicester midfield and then drill the perfect pass to the Spainard. Chelsea lead by that goal at the break. The second period started with the same open, enjoyable mood as the first. Both sides had chances within minutes of the restart, and Chelsea generated several before the Foxes regained their momentum around the hour mark. their ascendancy continued, and in the 75th minute the home fans erupted as Jamie Vardy was able to force home a loose ball in Chelsea’s box to level it at one all. From there it got more and more ragged, with the feisty home side digging deep to reach extra time. The time added on was a drab as affair as it often is, with both sides looking tired after the previous hour’s exertions. Just as the game looked to peter out, Chelsea found an extra gear, and sub Pedro nipped in to make it two one just before half time in extra time. The second half saw the home team throw everything at the Blues, but they just didn’t have enough in the tank to break down Antonio Conte’s defence.